On the last entry I wrote about my airlift by helicopter to Petropavlovsk in our friend from the fisheries research institute's helicopter. Now that I am back in Canada I still laugh when I think of such a big helicopter stopping so everyone can go mushroom picking high on the tundra. The last days in Petropavlovsk were illuminating in terms of the affect of the down-turn in the economy due to the devaluation of the ruble. 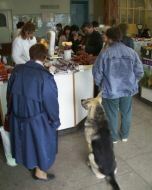 I went shopping for a last dinner for our friends before our departure on Air Alaska. Jennya and I went to the market close to her apartment. So much of the imported fruit and vegetables I had seen in the markets in May were absent. Instead people were more restricted to selling produce from their dachas and what they had gathered from the ocean and tundra. 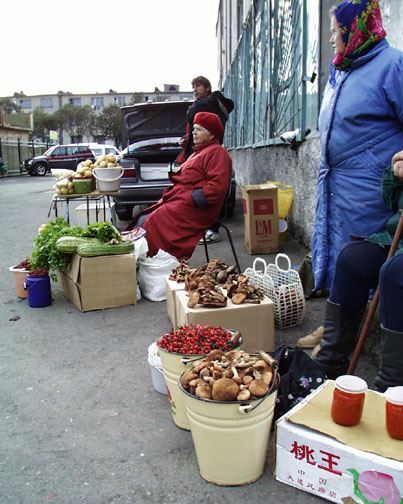 Thus wild mushrooms, like the ones we had stopped for, were abundant along with various wild berries, fish, and of course that wonderful Russian red caviar from salmon. In Petropavlovsk it is a bit of a conundrum about just how important the dacha is for survival. A "dacha" in Russia is a small house with up to ½ acre of land where one builds a cabin and grows a garden. They are located in large clusters and run communally. Many say that if a person can afford to buy a dacha that person is not so desperate. 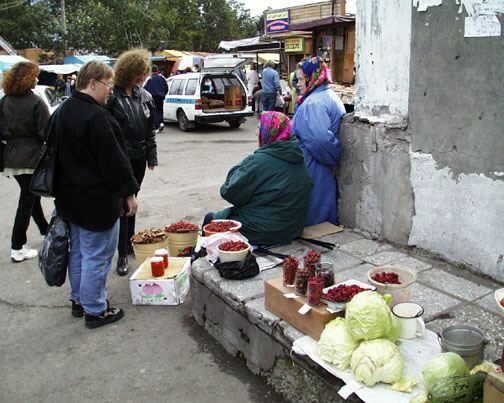 However, last week I saw many more people selling fresh produce from their dachas either in the markets or along the roadways leading in or out of Petropavlovsk. I think that now with so many people with no money from their salaried jobs, the ability to sell anything is likely even more critical. I love buying food either along the roads or in the markets. With one's bundle of bags to be filled with fresh produce you wander from stall to stall picking the freshest. You can taste the fresh butter or the caviar. No fuss is made about whether dairy products are pasteurized. Dogs and cats wander freely everywhere, entering shops with their owners like the one in the photo standing expectantly in front of the meat counter with its owner. The casualness and directness of this way of shopping is so much fun and instead of the tension I usually experience in supermarkets, it is also very relaxing. Returning to Canada is always a shock to my system. Living for 4 months in one of the world's last great wilderness areas in a one room cabin in a land with the bears and foxes for company is quite a contrast to the more complicated life I lead here. My life here by contrast has its positive and negative sides. On the down side: Noise pollution - I cannot believe how I cannot stop and listen on our 100 acres of land 40 miles north of Calgary for more than 5 minutes, without hearing some man-made sound. At Kambalnoe Lake, we only hear sounds of the natural world. The area is not on the jet-ways of the world and a helicopter may go by once a week at the most. Any man-made sounds are our own, such as the sound of Charlie's plane. The air too smells different. There is some residue of civilization I can pick up even this far from the city. I know I have developed a more acute sense of smell through living in the wild. Not surprisingly this redeveloped ability becomes anesthetized alarmingly quickly. What I focus upon and register in my brain visually shifts also upon my return. At Kambalnoe Lake I become very used to watching every detail for signs of critters moving on the landscape and when not doing that my eyes relax. This week, entering a large store for food and being faced with so many visual choices, gave me a headache. When I arrived at our camp at Kambalnoe Lake in May this year, I took off my watch. The peace that enters my whole being when I do not wear a watch for 4 months, with only the rising and setting of the sun and the weather dictating how I will spend 24 hours is hard to describe. I always promise myself upon returning that I will not get the "busy" disease and fall back into the excessive pre-planning of events that seems to prevail in our culture. I realized too this year that getting bored in my life is perhaps not such a bad thing. I really complain during the many days of storms that keep us cooped up in our cabin with very little to do. With only a week gone by since my return, I long for that uninterrupted time to just think! Having lived so closely to our cubs these last few months I have in some ways taken some of my new understandings for granted. This morning listening to CBC, I felt ill hearing some person talk about this "ferocious", "aggressive" black bear. Bears in some parts of Canada this year do not have enough food to store up for winter largely due to the drought I understand. The bears are desperately hungry and I am not surprised to hear they are short tempered. We notice with our cubs who are very respectful to us that if their food supply is short, they fight amongst each other. 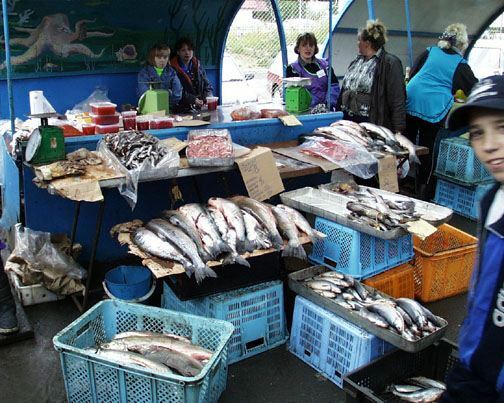 As soon as they have a plentiful supply of salmon - no problem. It is not the bear's fault that their range has been restricted by development so that in years of natural food shortages, they cannot wander afar for other food in another vicinity as their ancestors did. If we want to conserve our bears this question has to be considered. But I am happy to have returned home safely once again after a tough season. Wow, hot water continuously out of a tap. Clean finger nails. A change from outdoor gear (that has been worn repeatedly for 4 months) to more stylish sexier city attire. Friends to call and visit. My dogs, horses and cats still love me. My large spacious studio is still here. Our beautiful home is clean and has many rooms. Comfort and luxury. Alberta is a wonderful place too.